There are only a few truly remote places left in our world: the greatest depths of the oceans, the highest peaks of the mountains, the most rugged interiors of some deserts and jungles, and the poles the literal ends of the Earth. Palmer Station, on Anvers Island, Antarctica, qualifies. With no regular air service, the United States research station is accessible primarily via the ship the Laurence M. Gould, an ice-strengthened research vessel that shuttles supplies, scientists, and support staff members from Punta Arenas, Chile. 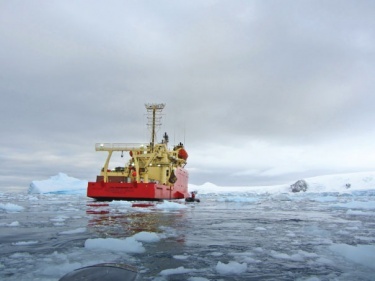 In mid-March (late summer in Antarctica), Department of Biology professor John Postlethwait and research associate Tom Titus boarded the Laurence M. Gould in Punta Arenas and headed south to Anvers Island, where they would spend several weeks at Palmer Station studying Antarctic icefish—specifically, the genetic sequencing of icefish—in an effort to understand genetic variations affecting bone mineral density that might someday help fight conditions such as osteoporosis in humans. It was a return visit for Postlethwait, who had conducted research at the station in 2008 and 2010, but for Titus it was a new experience, one he chronicled in a series of colorful e-mails to friends and family members back home. Titus's letters, paired here with Postlethwait's photography of the same journey, offer a reminder that research doesn't always take place in conveniently appointed labs, and that curiosity—the need to know, to discover, to understand—still motivates the most inquisitive among us to venture far, far from home in search of answers. It took half the day to find a rental car to go to Torres del Paine, a national park five hours north of Punta Arenas. But it was worth it. Driving north to Torres could have been the run between Bend and Burns on Highway 20: short brown grass, low trees and shrubs, the pronghorn replaced by guanacos and rheas. The hillsides are covered with southern beech forest, Nothofagus, one of the biogeographical markers that connect southern South America with Australia, Tasmania, New Zealand, and New Guinea into a pre-continental-drift Gondwanaland. There are even Nothofagus fossils in Antarctica. The next day we went to the Mirador trailhead. John headed up another trail for an out-and-back 26.2-mile trip that would get him his South American marathon, last of the seven continents that he set out to run years ago (See “Midwinter Marathon” below). The Mirador trail rose steeply from the valley floor; the climb at the end of the trail was 30 minutes of steep. It paid off. 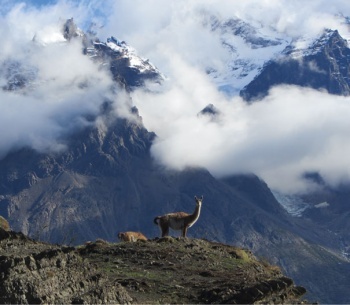 The Torres are three towers of vertical rock climbing straight out of a glacier. 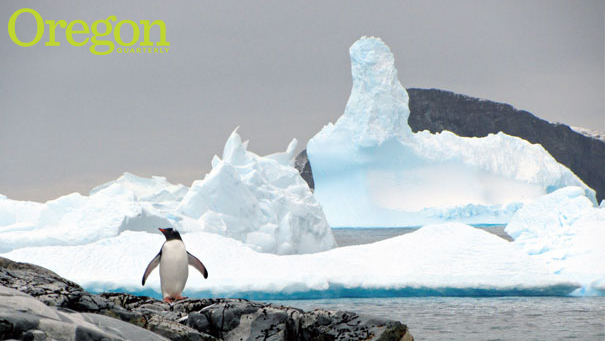 They are extreme, nearly violent manifestations of rock and ice. I sat on a rock for an hour watching wisps of cloud fold around the Torres like gray feather boas, then move off as though they recognized the futility of trying to soften those hard edges etched in blue sky. My camera batteries died at the end of the hour—as if they recognized the futility of trying to capture the scene in bytes and phosphors. The Laurence M. Gould pulled away from the pier at Punta Arenas at sunset. I’m bunking with a Colombian electrician most recently out of Seattle who doesn’t snore and has promised to help me with my Spanish. I should mention that our group of five represents the only scientists on this ship. All the rest are support staff members of various sorts, all here to help us do our thing. Amazing. By morning we were steaming south down the east coast of Tierra del Fuego, and the rock and sway had definitely picked up. I got up, ate a big breakfast, slept some more, ate a big lunch, worked out on the treadmill and bicycle, slept some more, then ate a big dinner and topped it off with one of the kitchen crew’s fresh chocolate chip cookies. This was good. Sometime after dinner, we cleared the southern tip of Tierra del Fuego and entered the unprotected Drake Passage. The Drake Passage is a DMZ between two oceans that, as near as I can tell, don’t like each other very much. This night they were sending up warrior waves, white-frocked watery pyramids 15 feet tall. Occasionally the spray tore loose like a clump of feathers and these became a wandering albatross that tipped and glided over the waves, disappearing into gray chasms, climbing back into view on the opposite side. The waves quartered into us from the rear, causing the 230-foot Gould to dance a circling pirouette. I needed some fresh air, like right now, and headed out on the back deck. Before long I was bent over a rail while my stomach wound up and pitched my dinner like a hard fastball, and in a moment of absolute clarity I realized why seabirds follow this ship. I thought it would be better to die in bed, and somehow crawled into my top bunk, taking the small waste bin from under the desk and propping it between my pillow and the wall. I found that by using my glasses leash that was hanging over a small shelf above my bed as a sort of plumb line, I could rock my head the opposite direction that the ship was rolling and stave off the nausea for a while, hoping that I could absorb at least some of my water and medication. I think this went on for two days. Then everything changed. We stayed inside the shelter of the islands paralleling the Antarctic Peninsula and the water was flat. The sun was out and the sky was nearly cloudless, and the mountains and glaciers were absolutely, hand-wringingly, heart-wrenchingly, mind-bogglingly beautiful. Even the experienced crew members were out on the deck, cameras in hand, all smiles, and I knew that it must have been an unusually beautiful morning. As the channel narrowed, the mountains came closer and everything became increasingly spectacular. That last day was absolutely beautiful. But if I had a million bucks to hire a helicopter to take me back to Punta Arenas at the end of my stay at Palmer Station, I might spend it. Do not take solid ground for granted. Go out and kiss it. Now. Life at Palmer Station is like nowhere I’ve been. On Saturday, the one day off, there is an event called House Mouse where everyone draws a cleaning duty out of a hat, and in one hour the entire station is cleaned. There is a list that gets checked off. The first item is “Choose Music” and the volume is always loud. There are only two locked doors in the entire station. One is the store. I can’t remember the other one. Folks leave laptops and every other thing lying around. I have never heard so many pleases and thank yous and you’re welcomes, seen so many people holding doors open for others, never been greeted so often. People are inordinately friendly and polite because of intention-driven necessity. They are nice first because they have to be nice, then because being nice is just the way it is, and then because they want to be nice because everyone realizes that being around nice people is better than being around assholes. Palmer is a small, confined place where people live and work in close quarters. There is no place to run, no way to avoid anyone. Positive relationships are paramount. For all its natural beauty, this human element is what I will miss most about Palmer. I’m already steeling myself to the reality of coming home to the daily, hourly encounters with people who are locked away, self-protected, sequestered within the bubble of their workaday world. Funny, isn’t it, how different we behave when psychological imperatives change the dominant culture? There is some gratification in knowing that people can choose to be different. We left Palmer Station about 8:00 a.m. on March 29. There was a lot of hugging on the pier, and when the ship pulled away, about eight people were out there doing the Polar Plunge—a traditional leaping off of the pier into water that is nearly freezing in honor of the departing boat. They looked like they were having a good time, but I was happy to watch from the back of the ship. Within a day or so we were into the Drake and there was nothing but the low-throated drumming of the ship’s engine and swells of gray water and rocking, restless rambling from one end of the boat and back again, waiting on breakfast waiting on lunch waiting on dinner waiting for someone to choose a good movie, fergodsake (this did not happen). I went to sleep and woke up to . . . silent stillness. We were tied to the pier in Punta Arenas. No rocking, no engine noise, no nothing. The sun was out and a rainbow terminated on shore. This must be a good thing. I now have to rethink my entire existence: how to walk, eat, sleep, throw up, exercise. I can actually get off of this ship and become the landlubbing bipedal quadruped that I once was. John and I went for a run on dirt and grass and concrete. There is no ice or snow anywhere. Tom Titus, a research associate in the UO’s Department of Biology, is the author of Blackberries in July: A Forager’s Field Guide to Inner Peace. It is June 21, 2008: Midwinter’s Day. Residents of Palmer Station traditionally celebrate the holiday with a reprieve from work and an evening plunge into the frigid water. Today, John Postlethwait is celebrating with a run at history. 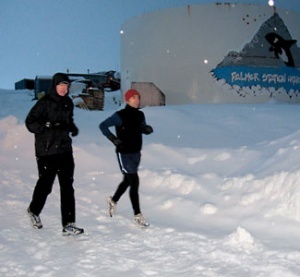 As he approaches the starting line, Postlethwait knows no one has ever completed an Antarctic marathon on the winter solstice, a day when the sun never clears the horizon and the temperature usually hovers well below freezing. But the University of Oregon geneticist likes his chances. Over nearly four decades, he’s tackled many feats of endurance with other members of the UO Noon Runners, a midday running group that began meeting on campus in 1961. Together they’ve turned the incredible into routine, with 49-mile runs around the Three Sisters among the highlights of their collective résumé. While Postlethwait has never been the fastest in this group of self-described adventure runners, his appetite for a good challenge is boundless. When he hit 40, he began the annual tradition of running his age in miles—on a single run. Now, after 24 successful age runs, Postlethwait is ready for a new challenge—a dream, really—to run a marathon on every continent. So far he’s checked off North America, Australia, Europe, and Africa. In Antarctica with the support of a grant to study icefish, realizing his dream seems much closer. Closer, perhaps, but reasonable? As he and four other intrepid souls trudge around (and around, and around) the 0.4-mile circumference of a glacier near Palmer Station, Mother Nature is doing her best to stymie Postlethwait’s ambitions. At 15 miles the wind whips up, slicing through his ski jacket like a frozen dagger. Even after three of the five starters call it quits, Postlethwait and fellow runner Paul Quienor press on. Seeking some degree of shelter from the bitter wind, the men descend from the exposed glacier and continue their effort on the snowy road below. With each circuit they draw closer to covering the vaunted 26.2-mile distance, until finally the moment arrives. As Postlethwait crosses the makeshift finish line his colleagues cheer. Midwinter’s Day marathon—complete. Postlethwait has since run marathons in Asia and South America to complete his global marathon challenge. “Scum-sucking bottom dwellers.”That’s what Tom Titus playfully calls the ancestors of the Antarctic icefish he and fellow University of Oregon geneticist John Postlethwait hope will lead to a breakthrough in the understanding of human bone loss disease. 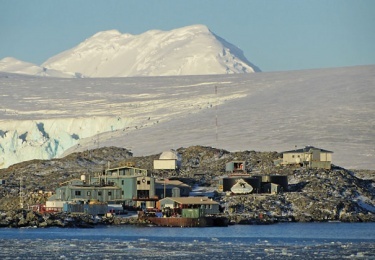 In a study funded by the National Institutes of Health, Titus and Postlethwait are searching for a link between the adaptive bone loss experienced by Antarctic icefish across countless generations and bone mineral density conditions such as osteoporosis seen in aging humans. Unlike the study’s bottom-dwelling control group the Antarctic rockcod, icefish have evolved a lower bone density that allows them to feed on prey closer to the water’s surface. The genetic factors behind this divergence are at the heart of the study, which seeks to pinpoint how specific genes affect bone density in icefish and humans. 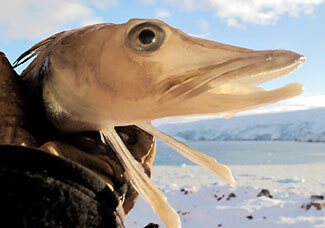 In 2008, faced with a dearth of background research on both icefish and rockcod, Postlethwait travelled to Antarctica to collect and preserve tissues, which he sent to project collaborators H. William Detrich of Northeastern University in Boston and Chris Amemiya of the Benaroya Research Institute in Seattle. They used the tissues to compile genomic libraries for the fish, allowing the team to observe exactly what genes are present in each species. The presence or absence of particular genes is one possible reason for varying degrees of bone density, but Titus and Postlethwait expect a different explanation. They hypothesize that both species of fish possess the genes necessary for dense, mineralized bones, meaning icefish have developed low bone mineral density through evolutionary changes in how those genes are regulated and expressed, rather than whether or not they are present. To understand exactly how this process works in the fish (with the ultimate goal of knowledge that may lead to improved bone health for humans), the scientists use powerful new research tools—including what Titus describes as “mind-boggling” advances in sequencing technology—that have led to a 25-fold increase in data extraction capabilities since 2009.